If you have ever been to a Budapest Christmas fair while visiting Hungary, you’ll surely never forget the appetizing smell of the mulled wine or the Chimney Cake (Kürtőskalács). Mulled wine is the symbol only of the winter fairs but the special cake can be bought during the whole year. This is one of our national desserts which is traditionally baked and sold in fairs and other open-air festivals, but you can buy it on some beaches, too. It can also be tasted in Romania, in Szekely Land, where also several Hungarian people live. Many of them greet guests with Chimney Cake even nowadays. In the former centuries, it was a festal dessert: it was baked for weddings, religious holidays, or christening, what shows how important role this cake played during the Hungarian history. It’s a spit cake which consists of flour, icing sugar, salt, yeast, eggs, milk, and butter. So it’s sweet yeast dough. Anyway, nowadays ingredients can be varied to satisfy people who are on a special diet. For example, there are cakes which are made from glutenfree flour or milk can also be substituted with plant milk. The yeast dough is rolled around a coned-shape baking spit. Finally, the cake is sprinkled with some granulated sugar. You can try this delicious dessert in various tastes. The most popular one is still vanilla, but there are also cakes tasted with some cinnamon, coconut, chocolate, or toffee. The traditional version is 35 cm long, but nowadays in fairs, it is usually sold in half pieces. Its external diameter is 8 cm, while the internal one is 7 cm. 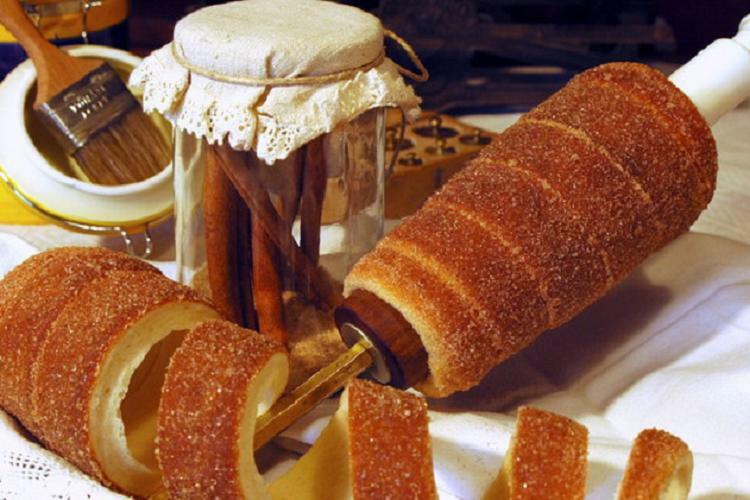 In the category of desserts, Chimney cake is surely one of the best-known Hungarian food. But is it Hungarian actually? Let’s see the history of it! The ancestor of Chimney cake is not Hungarian; the first written memories about a kind of spit cake is found in a manuscript from Heidelberg, round 1450. Anyway, later three versions of this dessert have developed from this predecessor. One of them is the Hungarian Chimney Cake. We have the first recipe of it from 1784. It is found in Maria Mikes’cookbook; she was the wife of a Transylvanian count. At the end of the century, recipes recommended sweetening after baking and also some nuts. In the second part of the 19th century, Chimney Cake is flavored with sugar before baking – in this way, the sugar is caramelized. Another type is made of fluid pasta and really common in Lithuania, Poland, Sweden, Germany, or Austria. Finally, the third group is baked by the Saxons in Transylvania; they also use a baking spit but they put the sheet of pasta in one piece onto it (and not roll it up). Have you ever thought that Chimney Cake has its own festival? Yes! This special dessert is the part of the Hungarian culture of gastronomy so it deserves its own event. This is usually held in the spring, in Budapest where even guests can try to make their own Chimney Cakes. Fairs always have a special gastronomy offer. Among ’main courses’, the salty scone is an absolute winner of each event. It is always salted and often seasoned with some garlic, pepper, or filed cheese. Langallo (Kenyérlángos), which is scone’s far relative, is also known as ’the Hungarian pizza’. Just imagine a pizza which is rectangular and has a thick paste. Buffets which sell pork sausage and chitterlings are always popular at fairs, and some festivals you can also buy roasted or fried fish. They are baked in much oil, so they are not surely healthier than pork but at least very delicious. Are you rather sweet-toothed? No problem! Beside the worthily popular Chimney Cakes, you can try strudels with several kinds of filling such as poppy seed, walnut, cottage cheese, or fruits. Children usually love honeycomb toffee which has a sponge-like texture and made of brown sugar, butter, eggs, and maybe some walnuts. Don’t forget about the king of Christmas festivals! Mulled wine can be made from either white or red wine, and it is seasoned with sugar, cinnamon, cloves, or raisins.